Summertime has arrived in San Francisco and there’s no better way to spend a warm summer day than in the sun, surrounded by friends, music, and good food. 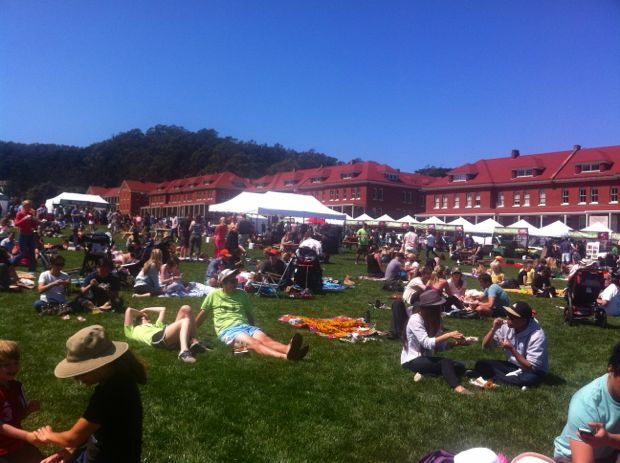 Lucky for us, the team at Off the Grid recently began a new event that includes all of the above, Off the Grid Picnic in the Presidio. This giant picnic takes place every Sunday (rain or shine) from 11AM – 4PM from now until October. Much like the original Off the Grid events, Off the Grid Picnic is, at its core, a food-centric experience. Unlike other Off the Grid events, however, it is not limited to “mobile vendors” (read: food trucks), opening it up to participation from some of San Francisco’s best restaurants. Organic Mexican fare from Nopalito, artisan sausages from Rosamunde, wood-fired pizzas from Del Popolo, sustainable sushi from Tataki, delectable ice cream from Humphry Slocombe, you can almost literally taste all of the variety and pride in ingredients that San Francisco has to offer in one place. For those that would rather put together their own picnic lunch, just across the lawn is an equally enticing farmers’ market. The market hosts a number of local farms, which offer up a variety of fresh, seasonal fruits, vegetables, nuts, dairy, and even chocolate. Food aside, Off the Grid Picnic’s best asset is the atmosphere – a wide open expanse of sun-soaked lawn with views of the water, set inside San Francisco’s historic Presidio Park. A DJ spins some background music, while wagons selling “Mimosa Kits” and “Bloody Mary Kits” weave through the lawn, enticing attendees to stay out and enjoy the day. The Picnic is both a family-friendly and dog-friendly event (which is rare to come across in the city) that is well-worth the trip. 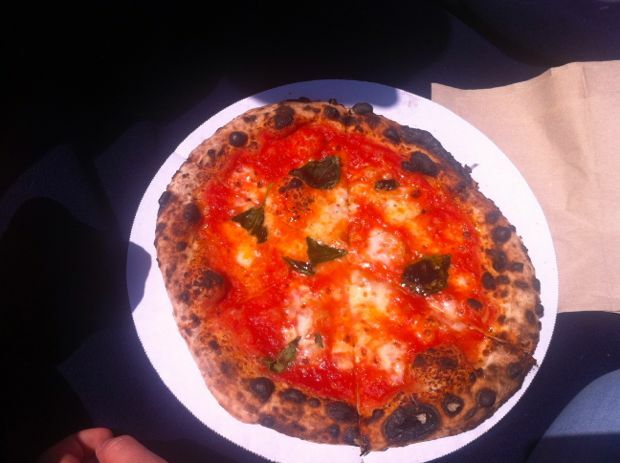 This entry was posted in Do, San Francisco, Stuff we love, Taste and tagged Del Popolo, food, Humphry Slocombe, Nopalito, off the grid, picnic, pizza, presidio, Rosamunde, san francisco, Tataki.